Peeking the infinite increases the space, the breath, the brain of whoever is watching it. The universe is a perilous but also a beautiful place. But the beauty of the universe it's not only in galactic shots, but also in mathematics. 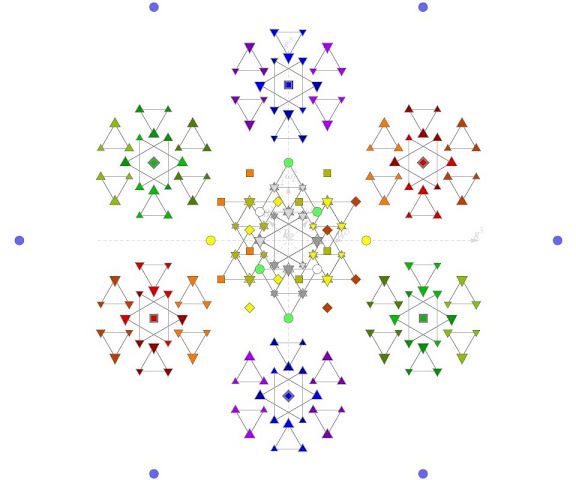 For example the maps of the E8 group seems flowers, and if we follow Garrett Lisi and his preprint An exceptionally simple theory of everything(1), these maps are also a sort of universe's flowers! The E8 maps in this post are extracted from Lisi's preprint and they represent the structure of the group (the first image is F4. 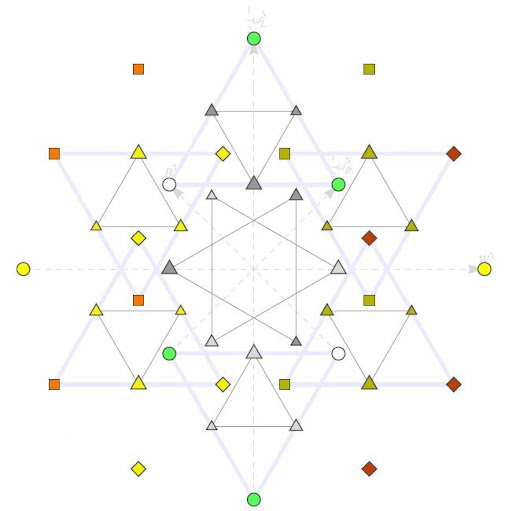 E8 is a Lie group, most important in physics because all symmetries group of the physical systems are Lie groups. The Lie group is an analytical group: all functions that we can define in the group are continuous. A physical example is the Galilei's group, and studying it we can argue information about free particles, described by Schroedinger equation. 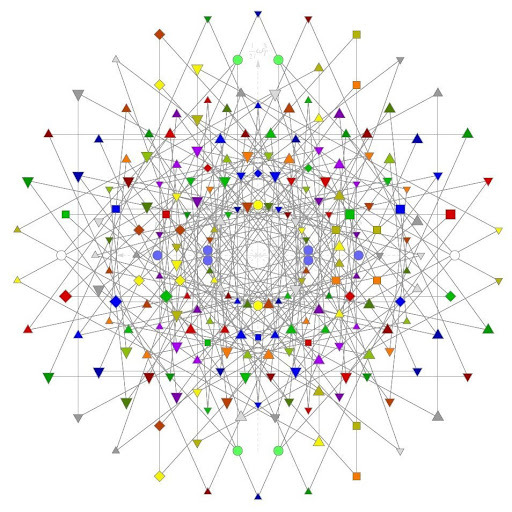 Also E8 is an important group for physics, but in this post I focused on mathematics. The group was discovered in 1887 by Wilhelm Killing and classified like exceptional, but a useful representation in order to study the E8's properties is founded by Atlas of Lie groups and representations in 2007. If I well remember, the announce of the discover had a great resalt in all media and it was ufficially given by David Vogan from David Vogan, MIT. A probably consequence of the great news was the creation of the Daivd's fan page on Facebook (in this moment it has 8 fan). In every case, the calculation presentation is published by Notices Amer. Math. Soc. 54 (2007), no. 9, 1122-1134 (pdf - see also the presentation). The images that I propose you seem flowers, and they could be beautiful, not only in a mathematical sense. 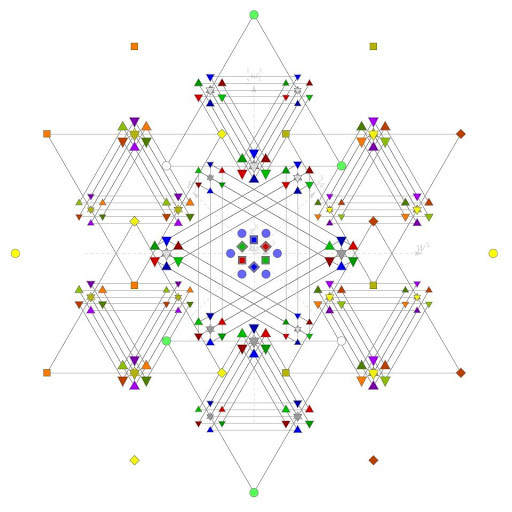 We can also consider them like a representation of E8 group, but a real mathematical representation of a symmetry group is an application that associates to every element of the group an operator, like a matrix, for example. And the rapresentation calculated by the Atlas of Lie groups and representations is a matrix representation of E8 group. The project started in 2002 from an idea of Jeffrey Adams, who described it in two preprint(2, 3). In the first paper(2), Adams, with Fokko du Cloux, described the mathematical basis of the work: definitions, theorems and lemmas need to calculate the representation of the group. The process is standard: the key point is that we are able to play with groups as if they were vector space, and use some particular maps like isomorphism, automorphism, olomorphism(4) in order to move between vector spaces. Every vector spaces, that are also groups, present some properties that allow simplified calculation of the properties of the starting group. The mathematical formalism is needed in order to develop the computational software, described in the second paper(3). The software is developed under Unix and run under all OS, including Solaris. (1) You can also read a Wiki page, an official blog and the attention of Peter Woit. (4) Isomorphism: it is a function between to spaces that let invariant multiplication. Automorphism: it is an application for which starting space and ending space are the same space. Olomorphism: is a differentiable complex function.